04/15/19: Updated Tools and Resources to address e-cigarette use in schools. Note: This site documents N.C.’s work on making public schools tobacco free, from 2000 until state law went into effect in 2008, and is provided as a resource for states and communities currently working to make their schools tobacco free. Factual information reflects research and data from 2000-2008. N.C.G.S. §115C-407 requires that every North Carolina school district have a written 100% tobacco-free school policy that prohibits the use of any tobacco products, including e-cigarettes on campus and at school-related events for students, staff and visitors. Please educate and train school staff to support this policy and tobacco-free school compliance by using the following tools and resources. A 100 percent Tobacco-Free school has a policy that prohibits the use of tobacco products by anyone, including students, staff, and visitors, on school grounds or at school events at all times. 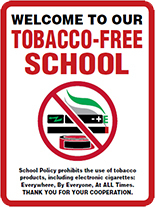 This tobacco-free zone includes school premises, school vehicles, and school events, both indoors and outdoors, and both on and off school property. In North Carolina, all public schools are 100 percent tobacco-free thanks to seven years of hard work by tobacco control advocates in local communities across the state. In 2000, the Tobacco Prevention and Control Branch hosted the state’s first Teen Summit in Charlotte. One of the main goals that developed from that conference was the need for 100 percent percent tobacco-free school policies that applied to school staff, parents and visitors – not just students. This means no tobacco use for any person at any time including sporting events and off-campus field trips. At the time of the summit, only five of 115 NC school systems had such a policy. Work began to increase that number. Since no state law covered the issue at the time, each school board had to be approached individually about developing a tobacco-free policy. Teens from communities around the state began to approach their local boards of education to request such a policy. They began having success and the number of 100 percent tobacco-free school systems rose steadily from 5 to 14. In 2001, the North Carolina Health and Wellness Trust Fund (HWTF), was formed from some of the funding received from the Master Settlement Agreement between states and the larger tobacco companies. In 2003, the HWTF took on the challenge of making schools in North Carolina completely tobacco-free. With support from the HWTF, Tobacco.Reality.Unfiltered (TRU) Clubs around the state significantly increased the number of communities considering and passing 100 percent Tobacco-Free School policies. TRU Clubs received advocacy training from Question Why – a youth empowerment organization under contract with the HWTF to train youth as advocates and leaders. By July 2007, more than half of the school systems in North Carolina were tobacco-free. This created momentum to make schools and campuses tobacco-free statewide. On August 1, 2008, a state law went into effect requiring 100 percent tobacco-free public schools in North Carolina. This website was developed by the Tobacco Prevention and Control Branch to share the history and tools of success of North Carolina’s Tobacco Free Schools movement, in hopes that other states will follow suit.